In the name of Sustainability: 25 Green Talents from all over the world were given their awards by the Federal Minister of Education and Research. 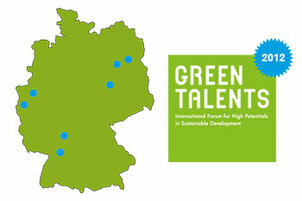 On October 23, 2012, as part of the FONA-Forum for Sustainability in Berlin, the 25 winners of the 2012 Green Talents Competition were given their awards. Hosted by the Federal Ministry of Education and Research (BMBF) for the fourth time, the “Green Talents – International Forum for High Potentials in Sustainable Development” attracted over 400 applications from 69 countries. In the end, the distinguished jury of experts selected 25 winners from 20 different countries, from Brazil to Zimbabwe, for their outstanding achievements in the area of sustainability. From renewable energy and resource management to the socio-political implications of new technologies, the winners 2012 covered an impressively broad range of academic research and achievement. Minister Schavan praised the sophistication of the scientific work being done by the awardees and emphasised the important contribution of the Green Talents Competition to the internationalisation of sustainability research. "Promoting the mobility of today's young scientists is the basis for research on an international level and collaboration in the future," said Schavan. Citing the growing popularity and recognition of the initiative, Schavan announced that the Ministry will host a fifth competition in 2013 and once again invite bright minds from around the world to Germany. The award ceremony was the final highlight of the winners' two-week tour of Germany. On visits to some of Germany's most renowned research institutes and companies, participants gained unique insight into sustainability research in Germany and had the opportunity to meet and exchange ideas with some of the most well-known scientists in their respective fields. 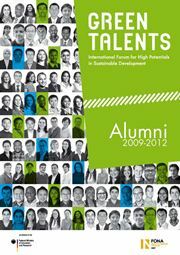 2012 also marked the first official Green Talents alumni reunion, which brought together winners from 2009 to 2011 and featured several networking events. 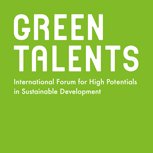 "Despite their diverse cultural and academic backgrounds, all Green Talents are bound by a common goal: to translate the principles of sustainability into real technological solutions and social concepts, and to generate awareness for these innovations beyond the borders of their own countries. 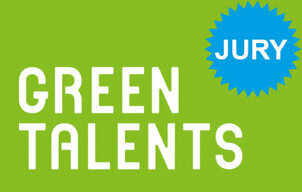 This is what makes all Green Talents ambassadors of sustainable development!" 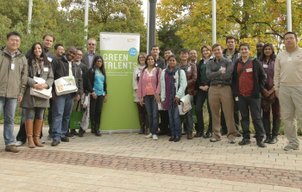 The Green Talents 2012 were invited to visit Germany between 09 - 24 October 2012. During the two-week tour across the country they learned about research on sustainable development conducted in Germany. But also and foremost they established new contacts, discussed their own research projects with experts, and actively contributed to the ongoing scientific discussion - not least at the 9th Forum for Sustainability (FONA) in Berlin. Here you can follow their tour through daily video diaries. more: Science Forum 2012.